Masterclass for me was the big experiment in 2017. I have always thought that there are young people with us who would benefit from being taught at an undergraduate level. I tried a session or two in 2016 - including John Donne's 'Goe, and catch a falling starre' dating from 1633 - which (so I was told) went well. I included it as a no-cost option for 2017 and had more than 40 names. The intention was to have a Masterclass at 16.30 after sports on most afternoons, but the sports and their aftermath of cheering, wiping off body paint and generally getting ready pushed this back to 17.15 and even then it was an encroachment on sports time. The feedback I had was really positive. Several took the material I prepared back to their own schools and told me what they had learned in just a few sessions was more than in their school year. The after-lunch 'homework' period was intended to be an opportunity for writing up what was achieved orally in the mornings, but it became an extra lesson used for various activities. I have renamed this 'Digest' for 2018 as this is the period for digesting one's lunch and within this period, one or more Masterclass sessions can take place. The concept was so popular with staff that several asked if they could take a Masterclass on subjects of interest to them. Rap lyrics were included as was a session on UK political structures. In 2018, there will be Masterclass sessions in the pre-sports 'Digest' period and for those who are not at that stage, teachers will use the class time as they see fit. The Course became 27 days instead of the 28 days it has always been in 2017. Under a new law, if a person under 16 is in the UK staying with a non-family member for 28 days or longer, this constitutes 'fostering'. The local Social Services department is then expected to have an involvement in that young person's welfare. Needless to say an involvement with a young person in the controlled environment of a British Council Accredited School was not an intended consequence of this law. The situation is easily avoided by making the Course 27 days rather than 28, so this is what will happen again in 2018. A School Council gives our young visitors the chance to express their opinions of the service we provide. A Councillor represents these opinions to management at Council meetings. The School Council in 2018 will be run by a Head Councillor who will chair School Council meetings. Students can opt to be a Councillor. A Head of School Council will be chosen from among them. These are positions of responsibility and a good thing for a CV. We do not stand still. Every summer is a learning experience and my international contacts give me ideas. Over the last few years, for instance, our excursions have become more 'bespoke'. We have provided a coach to London or wherever and the children have opted for different experiences radiating out from where they arrive. I have now decided that all the trips will be completely optional and am arranging a programme of small group visits which parents will book at the application stage. All these optional trips will be at cost price or as close to it as is reasonably possible. These are add-ons to enhance our visitors' experience of this country. One is the 'Harry Potter Experience' day out at Warner Brothers Studios to see the film sets, the costumes, etc. and to have a session with an expert on taking an idea from script to set. This is, of course, relevant to the video creation 'task-based' teaching that is a major part of our teaching programme. How UK English sounds: Our students are surrounded by British English. We teach the use of UK English word groups and speech patterns. How our students sound will complement their structural accuracy. A number of students and staff gave 'an audience with…' in front of the whole school. This was developed in 2016 as an adjunct to the Public-Speaking Competition and the Trinity preparation. In 2018 we had 'An Audience with...' Course Manager Tom and Angel. A huge addition to our social programme in 2015 were our 'MAD afternoons' – a dance and fitness programme developed by a Stephane Lobono's (VacStuds 1983-6) 'Monaco Arts et Danses' studio. Two of the instructors there (Magali Fiori and Fabris Kinsch) came for a week each and both loved the experience. 'Magic' Magali wrote to me afterwards: 'Everything was perfect.' As Fabris left MAD in 2017, our own dance teacher, Marcus Bell, took over and did a super job in 2017. In 2018 we had the superb Sarah Clark. The 'Task-Based' video-creation that has proved so successful will continue. There will be other lessons, too. More than half our 2015 students, for example, took the Trinity Graded English Speaking Examination and were given preparation for the conversations they would have with the examiner. This valuable preparation will be included in the regular teaching programme for everyone whether or not they are taking the Trinity Examination. Board Meetings with IGM let our students talk about how they feel the Course is benefiting them and how they think they are changing because of the international surroundings. The board meetings end in a Public Speaking Competition on the subject 'Days I'll remember all my life…'. From 2016, the third board meeting was for each student to speak extempore on his/her experience for two minutes. There will be two UK Reps in 2018. They will be chosen by letter of application, school references and Skype interview with IGM. The UK Reps' first week will be considered as time 'on approval' and the probationary period will extend for the remaining three weeks, just in case they think their places are secure and they can take it easy. Our past UK Reps tend to apply for staff Apprenticeships the following year. Apprenticeships in 2019 will again be for two weeks with double the number of Apprenticeships available. Apprentices may or may not graduate to staff the following year. This is such a popular option that all the positions are taken during the two weeks after the end of the previous Course. Those who apply too late are 'Prefects in Waiting'. They will be introduced to the concept and may get the chance to become a Prefect if any Prefect already appointed decides to drop out or if we make that decision. Each House was divided into two sub-Houses in 2015. This will continue in 2019. Each sub-House had a House Captain (= 8 House Captains). More than 8 House Captains may be appointed. The number will be reduced at an assessment meeting after four days at which other House Captains may be appointed. Sub-Prefects are 'Prefects Lite' without the privileges. The position of responsibility was introduced in 2015, worked well and will continue in 2019. This offers responsibility for other people to those under 16. The competitive 'League' matches in a variety of sports with each side dressed in their House colour will continue in 2019 – culminating in Sports Day. There will be one with its own password. I am all in favour of openness, but I prefer to keep students' names private and I am sure parents agree. Also, the trouble with being an innovator is that one's ideas get copied. There is one web site on which I can see my ideas regurgitated within days of my having had them. This is one of several 'organisations' run by former members of staff which present themselves as 'fully accredited' – by an organisation that has set itself up as an accrediting agency, but which is accredited only by itself. So I have a couple of 'secret' pages, visible only to parents and staff. What makes Vacational Studies so special? And with most students coming on personal recommendation, we are also incredibly international. Each year, I ask Norwich School (a top UK public school) to submit its best 15/16 year-olds for consideration. They are interviewed by me and the most outstanding are offered the chance to be students. They create English-speaking zones and are instructed to mix widely. They report to me on how the Course is going and they know I don't take 'fine' as an adequate answer. Our British students are known as UK reps. I don't know of any other organisation that emulates this. My belief is that a Course cannot be international unless the UK is represented in its student body. There is an added advantage. Our UK Reps are almost always excellent (they are on a one week probation when they come to weed out those who fall short of expectations) and most of them apply for jobs on the Sports/Social side of the Course two years after their time as a student. This means that they know exactly how the Course runs, what activities work (and don't work) and what the students want. They have been there; they know. In the year after their stay with us as a student, they may apply to be an 'Apprentice' on the next year's Course in preparation for their work as staff. Vacational Studies has always been run by me. I started it as 'Educational Holidays' in 1971 which I ran with two others. In 1973, I formed 'Vacational Studies' without partners. The values established over generations are constant, but every year is different and every year is special. For all our students it is a developmental summer and, as I shall say to them many times, 'you are creating at this moment memories that will stay with you for ever.' I have trademarked our strapline 'Days I'll remember all my life™'. 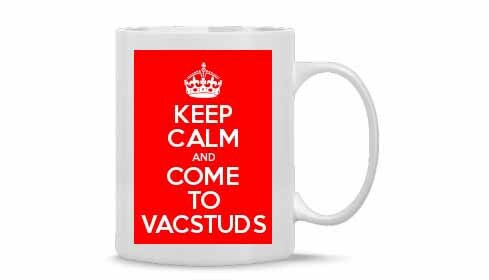 Christelle is also responsible for giving me the idea for our cheeky little 'Keep Calm and Come to VacStuds' mug. This was offered as a prize in a quiz in Monaco. Vacational Studies limits the number of students from any particular country and tries to balance the number of boys and girls. This engineering is a clearly stated policy to create a course on which English is the language used socially and boys and girls can make friends from many countries. In most areas of life nowadays, this would be simply impossible. The Course is structured around a four-week period. The task-based project takes this length of time to complete and I know from experience that it is in Week 2½ that the inhibitions and barriers break down and this is when rapid progress is made. Our students do not find four weeks too long. The tears at the end show this. But four weeks is a big step for some teenagers – and their parents – and it may be that holiday arrangements make four weeks impossible, so here is a the 'Lite' programme. Any two or three weeks can be chosen. It is 'Lite' because it is shorter, but also because whatever is in the programme during the weeks not chosen will clearly not be available. For uncertain newcomers, I suggest the first two weeks as the last two weeks can be added. We try to make the learning part of the Course as different as possible from the student's lessons at his or her own school. No one wants to come to England in the holidays to go straight back to school. When everyone has arrived, we assess their level of English. We do this partly with a written test we have used for some years. Written English is only one of the skills, though, so we also look at spoken English. In addition, we try to ensure that the class is made up of those of a similar age, of boys and girls and of different nationalities. When we have class composition right, we look at how everyone works together and may, in the first few days, move people up or down according to their ability. Because the level of ability in the 'first' class varies so much from year to year, a student may be in this class for two or three years even though he or she may have made great progress. It all depends on the relative abilities of the other students and the next highest level. It is the actual teaching that is so different from everything our students have experienced. Much of the Course is taught through the medium of video-creation. The teacher will present the class with a theme. This theme forms the basis of the most of the work done in class. From this theme, the students will, by working in groups, create a script under the aegis of the teacher. In this process various aspects of grammar and orthography will come up for analysis. When the script has been decided on, the class will choose who are to work on the editing and production side of the video and who are to be the actors. Using digital film cameras, the classes shoot their films. Using Windows MovieMaker or other software, the classes then edit the footage. By this time, each class will be working together in an international group using English as a working language. They will probably no longer be aware that they are using English as a subject. It will have become second-nature. The edited footage is then uploaded to Shutterfly so that everyone can see the result. Take a look at previous years' student videos by clicking here. To help our students use English colloquially and with facility, we have a number of English youngsters who join the Course at my invitation and are just like all the other students with the exception that their 'job' is to mix with everyone and to be 'learning resources'. We also use them to give one-to-one help if we feel that one of the youngsters would benefit, socially or educationally, from the assistance of a peer. Vacational Studies is a very structured experience. While a young person is with us, we aim to provide immersion in a new and engaging multicultural English-speaking environment; a life that is utterly different from life at home. We construct a teaching programme that bears no resemblance to traditional English lessons at school, an activity programme that is novel and exciting and English-speaking friends from all over the world. We ask that parents trust us to get on with the job and know that we will contact them if there is something they need to know. In this context, constant contact with the known and familiar detracts from this experience. For this reason, we ask that mobile phones are not brought and, if they are brought, that they are kept in the office for use only on trips. We have two telephone afternoons so that parents can talk to their children and they can make and receive calls on the payphone any day after activities end at 21.00. We found that a small number of children had second mobile phones hidden in their dorms at the request of parents. In our rules, which parents give signed agreement to, we state our policy on mobile phones. Just as parents have trusted us for 43 years to provide exactly what we describe, we trust parents to abide by the agreement they have signed. It is important for us to know that the children for whom we accept responsibility understand that their parents trust us. If a parent asks a child to act against the rules, we are undermined. We cannot discipline children for the actions of parents who undermine us. By the same token we cannot accept responsibility for children who selectively break our rules at the request of parents. We consider this makes it impossible for us to exercise our duty of care and is thus a breach of contract. In the last 45 years, many of our students have achieved international success. I am featuring two of them here. Vytas Paskunas came to us from Lithuania when in 1992 when his country was just emerging from years under Soviet control. He writes modestly of his achievements. He achieved five 'A' grades at 'A Level' and went on to achieve a First in Maths at Cambridge. He is now a Professor of Mathematics in Bielefeld, Germany. Here is his letter to me. In Vytas's case these most certainly are 'Days I'll remember all my life'. Jesus Silva was with us for several summers in the 1970s as a student and the 1980s as a helper. He was the Spanish Ambassador to Panama and is now Ambassador to Venezuela. Here is a link to a newspaper interview he gave when he was Ambassador to Jamaica. My boys and I were his guests at his residence in Kingston a few years ago. Articles and information on other VacStuds students gratefully received. The Vacational Studies Foundation was registered as a Charity under English Law in January 2000 to assist talented children. Alumni of Vacational Studies who wish their children to have the same international experience they had, but cannot send them for financial reasons should contact IGM at vacstuds@vacstuds.com or the Chairman of the Trustees of the Vacational Studies Foundation – Francis McIvor – at fjmcivor@yahoo.co.uk. Our 'UK Reps' each summer come courtesy of the Vacational Studies Foundation. We welcome nominations for the Scholarship in 2019 and 2020 which should be sent in confidence, and without informing the projected recipient, to Vacational Studies. I shall forward nominations to the Scholarship Committee of the JWA. My father, who was CompanySecretary from the founding of Vacational Studies until his death in 2003, was a great support to me. In his memory, the Jörg Weise Association has donated in perpetuity a full Scholarship which I am able to award when I come across a young person who would benefit from our Courses, but cannot apply for financial reasons. If you know one, tell me.